The 1920s is often recognised as a decade of fascism, flappers and film. 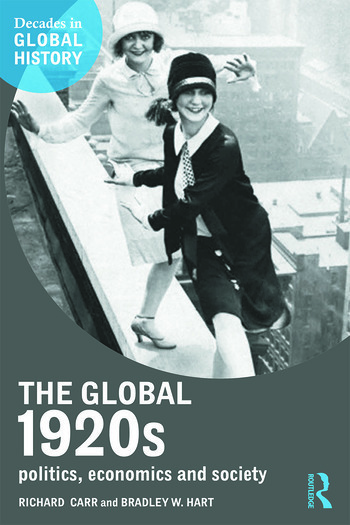 Covering the political, economic and social developments of the 1920s throughout the world, The Global 1920s takes an international and cross-cultural perspective on the critical changes and conditions that prevailed from roughly 1919 to 1930. With twelve chapters on themes including international diplomacy and the imperial powers, film and music, art and literature, women and society, democracy, fascism, and science and technology, this book explores both the ‘big’ questions of capitalism, class and communism on the one hand and the everyday experience of citizens around the globe on the other. Utilising archival sources throughout, it concludes with an extensive discussion of the circumstances surrounding the 1929 stock market crash and the onset of the Great Depression, the effects of which were felt worldwide. Covering topics from the oil boom in South America to the start of civil war in China, employment advances and setbacks for women across the globe, and the advent of radio and air travel, the authors provide a concise yet comprehensive overview of this turbulent decade. Containing illustrations and a selection of discussion questions at the end of each chapter, this book is valuable reading for students of the 1920s in global history. List of figures. Acknowledgements. Introduction. 1. Empires and the aftermath of Versailles. 2. Equality, class, race and general living. 3. Science and technology in the Jazz Age. 4. Film, music and other pastimes. 5. Art, literature and the convergence of culture and politics. 6. Women and society. 7. Democracy and its malcontents. 8. Communism. 9. Fascism. 10. Global economic conditions in the 1920s. 11. The calamity on Wall Street. 12. Responses to the Crash. Conclusion: A Global 1920s? Index. Richard Carr is a lecturer at Anglia Ruskin University, UK. He has written several books on political history including Veteran MPs and Conservative Politics in the Aftermath of the Great War: The Memory of All That. He is currently authoring a biography of Charlie Chaplin for Routledge. Bradley W. Hart is an assistant professor at California State University, Fresno. His previous works include George Pitt-Rivers and the Nazis, a biography of a prominent British anthropologist and fascist sympathizer, along with the co-edited volume The Foundations of the British Conservative Party.